"I stumbled across your site by accident and what a pleasure it was." 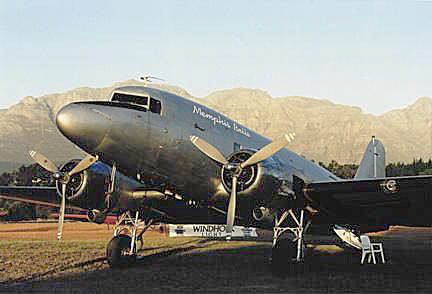 For your info, DC-3 ZS-LVR gained it's "Memphis Belle" moniker in 1996 when I was flying the aircraft for an independant RSA Cargo airline and before that for Africa Cargo Airlines, both out of Lanseria RSA.. 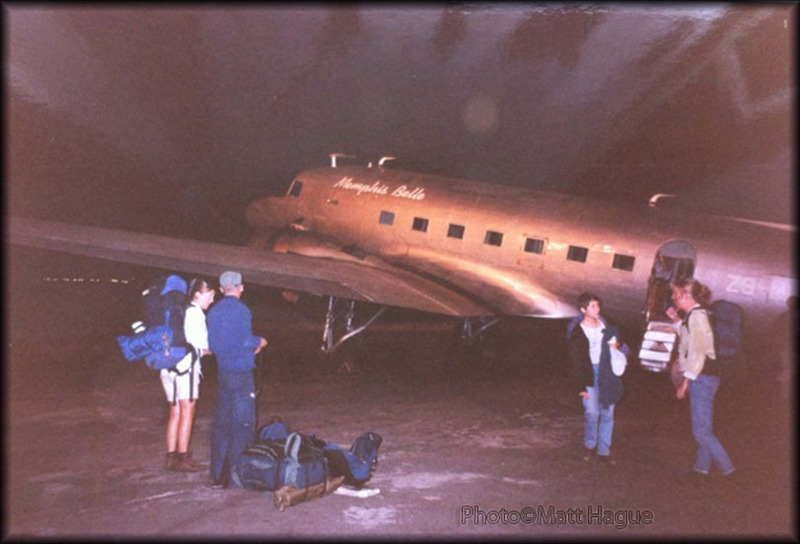 I have included some photos that may be of interest"
Mark wrote: "ZS-LVR is indeed a unique Dak, it was fitted with the 'Pan Am'-modification (extra wing tanks) resulting in a 12 hour endurance; it had a cargo floor like a C-47 and R1830-94 uprated engines. When I left her (1997) she had only circa 16,000 hours on the airframe. The aircraft was used in a TV advert in South Africa for Volkskaas bank, if you ever get to see it, it's me doing all the flying. There were a lot of rumours surrounding LVR: was it ex CIA, did it operate off an aircraft carrier and many more strange historical rumours..."
Mark is giving her the thumbs up, all system ready to go ! "It's good to see her looking so nice now at Nelair, when I left her (April 97) she was looking a bit worse for wear externally as we had been operating her hard from Lusaka in Zambia, in and out of Northern Angola in support of UNITA, but that is another story. I have written a book about it all and it should be available on Amazon in the next few months. Let me know if interested and I'll send you the link when available." "In fact, originally the name "Memphis Belle" was emblazened in 30 cm high lettering down each side of the aircraft. I am sad to say that it was me that put it there under treat of termination of my employment if I refused ! I think it's tacky and is a true reflection of the owner at that time." Without a doubt this aircraft was the finest that I ever flew and I shall always have very fond memories of her for keeping me safe when all around was enveloped in danger. As I was trying to explain to a fellow pilot of some of the activities of my 'misspent youth', I began to scan some images of my former office. I was a Magnetometer operator/ Electronics technician for the Aero Services Corporation, 8100 West Park Ave., Houston, TX. The Company was engaged in Aeromagnetic Geophysical Survey. Aeroservice operated several Aircraft, mostly Piper Pa-31 (Navajo) and Cessna 400 series (Titans). 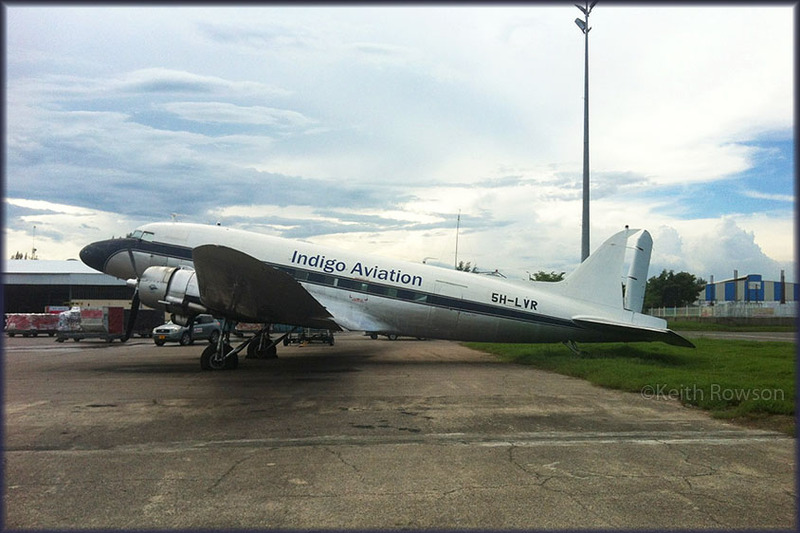 They also had a DC-3, registration number N5000E. I was curious as to what had happened to that aircraft as I had spent many hours either fixing it, or operating the Data collection equipment. I traced the registration number via the FAA website and further down the line came to your website. I would like to share some photos with you, I took them in 1981, April I believe. I am sure of the year, less sure of the month. The orange and white objects under the Aircraft are Varian Magnetometers and are called “Birds”. These were used in measuring the Earth’s magnetic field. The reasons there are two of them is that the forward unit was lowered below the aircraft to about 300 feet and the second one was lowered to about 600 feet. This was done to measure the vertical gradient of the magnetic field. The Signal from the Birds was sent up the cable, which had a coaxial center, and was directed to the computer equipment in the second image. 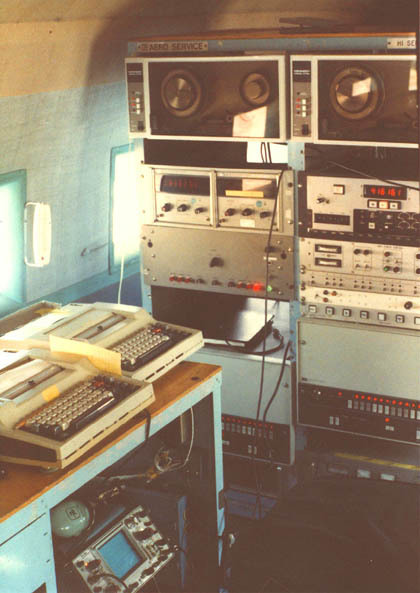 The Rack on the left was for the Magnetic data, and the computer on the right was for Navigation. We flew in a grid pattern laid out by a Geologist over the most precise maps that we could get. Sometimes, it was a roll of satellite photographs taped end to end with a line drawn down the middle. In combination with the Enhanced Loran C and a Doppler radar for ground tracking, we did pretty good for the day. Now, I stare at a handheld GPS that is smaller than my cell phone. A 35 mm cine camera was synchronized to our ground speed, via a signal based on the Doppler output. The speed of the film would speed up or slow down based on the ground speed signal from the Doppler radar and with a fixed slit aperture, would give us a long continous negative. This was used to verify our course over the ground. The Doppler Radar would also give the course correction for wind so that we would fly straight lines. If you notice, there is a logo from Litton Industries, to which Aero Service was a subsidiary, as was Western Geophysical. Both were located in Houston, though Aero Service began in the early 1920’s in Philadelphia. Western Geophysical did Maritime Geologic survey, and oil field support. As a side note, I flew a project that took us over Mt St. Helens, in Washington state, 3 months after the explosion. And curious enough, today (02Oct04) the volcano had a minor eruption. I have a profile view, that shows that funny nose was present in 1981 (below). It was shot at about the same time and on the same project. I am not familiar why it is that way. There was no weather radar on the aircraft when I was on the crew. If you look carefully, you can see the co-pilot’s boots has he catches some extra sleep time while he waits for us. I usually took care of the aero service equipment, and on occasion the Avionics, and I never had a need to pull the Nose. N5000E still had it’s Army Signal Corps N1 Compass system. We had to get the Gyro repaired. For aerial survey work, we had to turn off transponders, air conditioning, DME, and anything else that would generate a magnetic field, even the latest “cool” technology of the time, the Sony walkman ! So having weather radar was not a useful item for us. And we needed very calm air to prevent anomalies created by turbulence (bouncing of the Birds), so IFR, and just general bad weather flying was out of the question. We used to create a magnetic field with special coils in the x,y, and z axis to “hide” the steel crankshafts spinning up front from the magnetic sense which we hung below the aircraft. Sunspot activity used to shut us down, as the Earth’s magnetic field would have been too active to measure, so quite frequently we would be sitting at the airport, watching our stationary unit (usually hidden in some shed with a very long cable running out to the middle of nowhere). When the activity was stable for at least two hours we would try to go up and capture some data, but very often we sitting around cleaning and fixing equipment. Of course, we had some mechanics, and other FBO folk who thought it was a scam. Fortunately for us, our bosses could check with the USGS (United States Geological Service), and we had our own magnetometer systems in Houston they could check. I remember there was a Dymo label affixed behind the Pilots head, the boldly proclaimed, “DO NOT LAND IN SWITZERLAND”. No one at the time wanted to talk about it.... The story I had heard about this Aircraft was that it had bellied up in Alaska, then after the World War II it was recovered and converted to a Panama sleeper in McAllen,Texas. There had been a placard to that effect on the Pilot’s side. I must add that this aircraft did take fire from a Rancher in Oklahoma. He thought we were trying to scare his cows. We would fly at about 3000 feet during our normal survey work. I know he was a Rancher because he met our flight crew at the Airport after landing. We had one hole in the tail. We did not press charges, and we were able to convince him that we were not some kind of aerial hooligans. Good shots, those Oklahomans ! 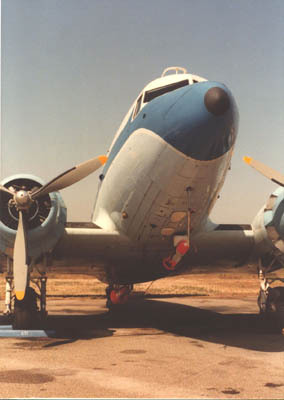 "Reference to ZR-LVR/N5000E DC-3: I worked for Aero Service Corp. on this DC-3 and flew surveys with it around the world. My position was a Electronic Tech. I Installed with co-workers the original Airborne Geophysical Survey system in our hanger at Philadelphia,PA (USA). To say the least, this aircraft found the Alaskan oil deposit of 30 Billion Barillas of oil in 5 days flight time !" "See the attached (poor quality) photo I took of a most beautiful aircraft: DC-3 (ZS-LVR) Memphis Belle. I was hitching a lift from Blantyre to Lanseria on her, with some friends, in early 1999." Matt asked: "Do you know if she still flies, and where she operates now?" My reply: "In 2000 this C-47 (c/n 20475) was reported to have been damaged, reports of a hole in the fuselage. This was repaired and then at Lanseria some fool tried to steal fuel during the night and he used an open flame for illumination: the aircraft was subsequently damaged by fire. This was in 2002. But this damage was repaired too, and I have a report of it flying during Nov.2003 (Lanseria) for Nelair Charters & Travel Service. In 2008 it was bought by Skyclass which was to be based at Rand, but I don’t know if that took off. It was still registered ZS-LVR at that time. 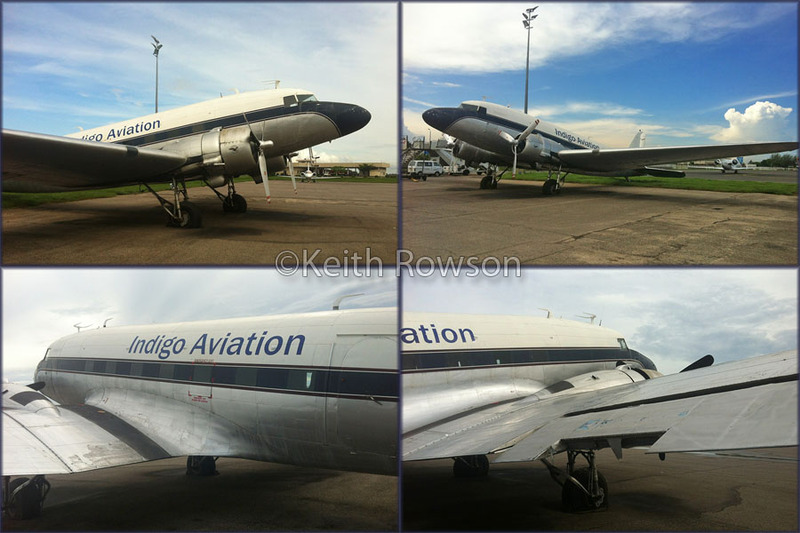 By late 2009 it was sold to IndiGo Air of Tanzania, reregistered as 5H-LVR, to be operating the last scheduled passenger flights using a DC-3. But this was short lived. Actually the ferry to the new operator was done early 2010 and IndiGo’s license was suspended in july 2010! The aircraft was seen stored at Zanzibar a few months later. Afaik, it is still there, waiting hopefully for another chance to fly. It cannot have ran up many hours over the past 12 years, with all that misfortune!" 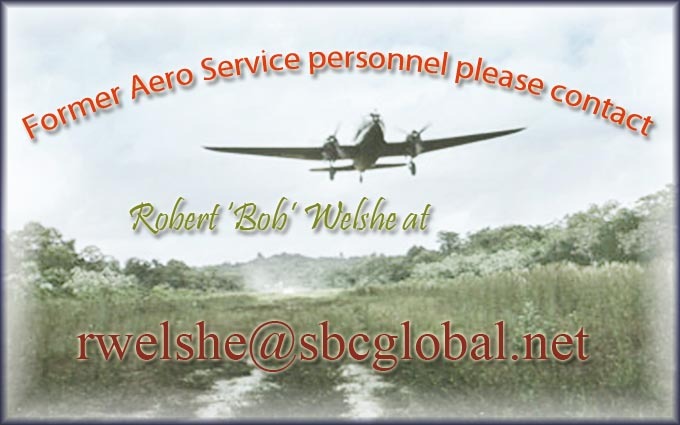 Former Aero Service staff are invited to contact Bob Welshe at the above adress. and has no bearing on Aero Service (afaik). Been there since Indigo stopped operations. This aircraft has a fascinating background. 5H-DAK is in Zanzibar". From Gooney Bird to Jets, T. Robert 'Bob' Schultz looks back on his days flying this DC-3 as N950. This DC-3 while with Aero Service Corp.